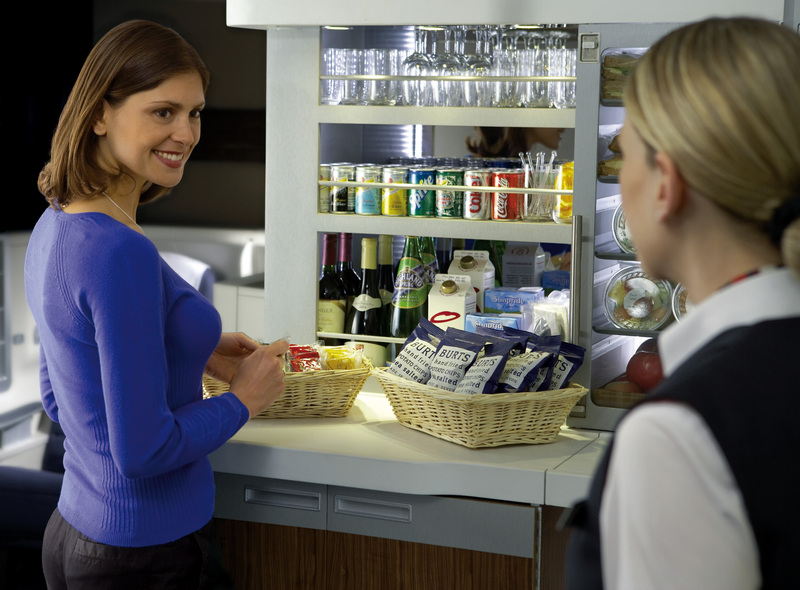 5 December 2014 | In order to make as much as possible of the limited ‘real estate’ onboard their aircraft, airlines such as British Airways (‘Club Kitchen’), American Airlines (‘Lobby Bar’), Japan Airlines’ (‘Sky Gallery’) and China Airlines (‘Sky Lounge’) have been reimagining how the galley area of the premium cabin could become the domain of passengers as well after regular service is over. 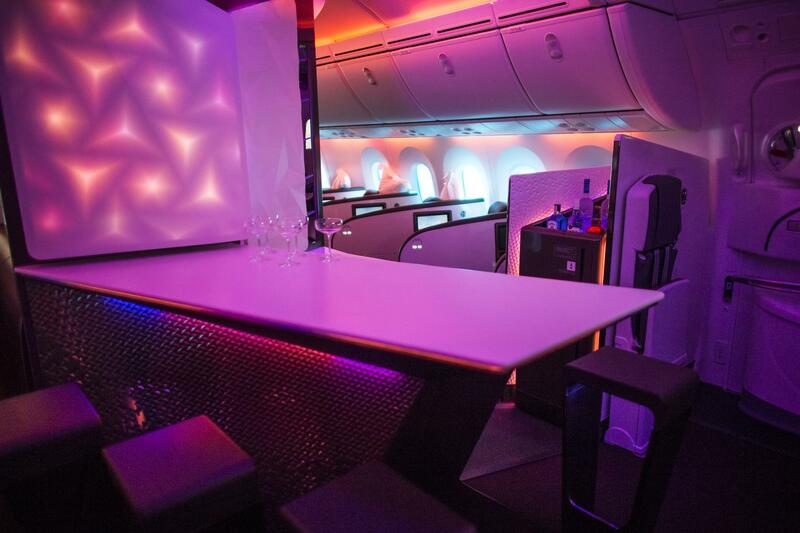 On a similar note, Virgin Atlantic – which is also known for its signature Upper Class onboard bar (one of the very few airlines to actually install a bar on aircraft that are not an A380) – has come up with an inventive concept on its new B787 Dreamliner that is called the ‘Wander Wall’. While the sit-up bar is for Business Class passengers only, those in Premium Economy on the airline’s B787 are encouraged to stretch their legs and come over to the ‘Wander Wall’ and mingle with other passengers and crew. Developed to reflect the design of the Upper Class bar, the social space offers a mini fridge, water fountain and a self-serve area where passengers can help themselves to snacks and refreshments. The onboard enhancements to the initial New York service are supported by a refurbished Manhattan-themed Clubhouse at JFK Airport, which opened on March 5. 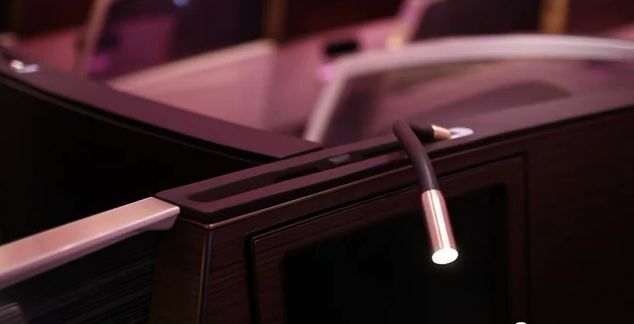 Virgin Atlantic’s new Upper Class ‘Dream Suite’ is described by Australian Business Traveller as “a stylish evolution of the current design. It ditches Virgin’s trademark purple leather seat for darker chocolate-black tones accented by wooden veneer and brushed metal,” while Virgin summarizes the new interior as follows, “The cabin has a fabulous new look, with a stylish, uplifting interior, flashes of our famous red, and Swarovski crystal accents for that touch of Virgin Atlantic sparkle.” The new Dream Suite is more spacious than Virgin’s current Upper Class design and offers an extra 3.8cm of seat’s width while folding out to a massive 218cm long lie-flat be, which Virgin says is the longest offered by any airline. Other new features include a ‘literature pocket’ for stowing books and magazines plus a flexible LED reading lamp which snakes down from the top of the divider wall (images here and here). 3 December 2009 | Lufthansa recently announced that it will reintroduce its ‘FlyNet’ broadband Internet on long-haul flights. Emirates also revealed it is studying the business case for Ku-based broadband Internet. Currently, the airline offers AeroMobile’s basic cellphone connectivity on about 60 aircraft. Virgin Atlantic is possibly the next long-haul airline to offer inflight Internet. The airline will renew its fleet between 2011 and 2013 with the arrival of several A330, A340 and B787 aircraft, and is currently working on the introduction of new products and services. In what is a first for the airline, Virgin Atlantic used social network site Facebook to get feedback on what they would like to see in terms of inflight connectivity on the new aircraft. Last week, it asked its 21,000+ Facebook fans a few questions about their connectivity desires. Facebook users could respond to questions like “What are your wireless Inflight Entertainment expectations for Virgin Atlantic?”, and “How would you prefer to pay for the usage of Internet onboard?”. How it works: Passengers log onto the service and enter their flight and destination details and the website will match them with a suitable travelling companion. They are then sent the details of the matched traveller and can decide whether to agree to the match and make arrangements of where to meet upon their flight arrival. Passengers can also print off a taxi² sign from the website so they can locate each other at the airport. The system also matches female travelers who only want female travelling companions. The program is not limited to Virgin Atlantic customers and passengers on other airlines can share rides as well.